Nana Gomoaba Apata Kofi V Odikro of Gomoa Pomadze in Gomoa East has called for support to complete their self-help police station building that has come to a halt as result of financial constraints. He said, if the project was completed, it would go a long way to bring total security, peace and development to the area. 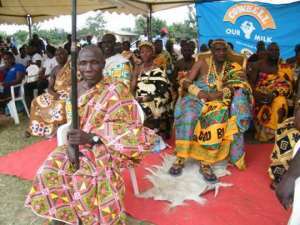 Nana Apata Kofi V, who is also the Guantuahen of Gomoa Ajumako Traditional Council made the call at a durbar to commemorate their 2018 AKwambo Festival (Mpuntu Afahye) to complete their self-help police station project held at Gomoa Pomadze. The Festival, on the theme 'Security is a tool for sustainable development in the society' was to mobilise funds towards the completion of the project that they started three years ago. He said with the establishment of a University in the community, many people had come to settle there, and subsequently attracted, armed robbery activities, which continued to disturb their peace and development. Nana Apata Kofi said they petitioned the then Inspector General of Police Mr Mohammed Alhassan for the establishment of a police station in the community, which he gave approval and Deputy Commissioner of Police (DCOP) Rev. Nenyi Ampah-Benin who is now the current Central Regional Police Commander cut the sod for the commencement of the project. 'We thanked the Gomoa East Assembly and all who have also contributed to the project that has reached the lintel stage and since the problem that led to the commencement of the project is still a major challenge in the area, we are calling for support to complete it'. He said development was not the sole responsibility of the government or some particular personalities and called on all people to join the crusade for development and growth of the area. Nana Ayabaw Mbir, Chief of Gomoa Nkreen who chaired the programme commended his colleague chief and the entire people of the area for celebrating the festival peaceful, and urged them to put aside their differences to enable them forge ahead as one people for common development programmes.